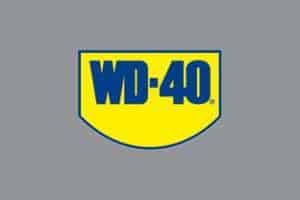 Why clean brass or polish brass? Brass and gold brings a burnished and warm glow to your household items. From door knockers and switch plates to bathroom fixates, furniture, utensils to lamps, brass and gold are used extensively. Gold and brass are corrosion resistant and strong alloys and because of their bright gold colours, they are one of the most popular decorative and home furnishing materials in the world. Just like any other metal, brass and gold also tend to become tarnished and dull over time. However, you can easily clean brass items and polish brass to let them shine as bright as they can and make them look as good as new using the right brass cleaner and brass polish. Cleaning and polishing gold and brass lamps or other items is not difficult and you can do it with things that are commonly found in homes. Before you begin with to clean brass items, you should find out whether the items are pure gold and brass or there is a mixture of other metals in it as well. An easy way to find it out is using a magnet. If the magnet sticks to the surface, it means there are other metals in it as magnets do not get attracted to solid brass and gold. If the items are plated, you can clean them with hot soapy water. However, polishing or rubbing them too vigorously with brass cleaner will remove their plating and can make them appear dull. Therefore, proceed with caution. There are many ways to clean solid gold and brass lamps. The approach you take should depend on the level of dirt, tarnish or dust that has built up on the surface. Here are some simple techniques and tips. Take a bowl and put some hot water in it. Now add liquid soap to the water and mix it well to get a fine solution. Take a cleaning cloth and rub all the surfaces thoroughly. You can also use an old toothbrush to clean the crevices of the lamp. Once you are satisfied with the cleaning, rinse the lamp using warm water and dry it up thoroughly. It is a great to clean brass. If there are some tough stains, dirt or tarnish on the gold and brass lamps, you can use tomato ketchup, paste or sauce, which is a great to clean brass and polish brass. Rub a thin coat of one of these on the surface of the lamp and let it sit for at least an hour. Once done, clean it thoroughly with hot soapy water. You can also use simple kitchen ingredients to clean gold and brass lamps. Make a mixture of equal portions of white vinegar, flour and salt. Mix it well and apply it to the surface of the tarnished lamps. Let it sit for at least an hour. Now rinse it with warm water and let it dry. All the tarnish will disappear and the lamps will look as good as new. Another great method to clean and polish brass and gold lamps is to wash it up with a combination of salt and lemon. Take a lemon, cut it in half and remove the seeds. Take on half of the lemon and coat it with salt. Now rub it on the surface of the tarnished brass and gold lamps. You can recoat the lemon and salt as needed. Cover the entire surface of the lamp with this, take a clean and dry cloth and buff the lamp to a shine. You can also make a mixture of one part lemon juice and two parts cream of tartar. Make it into a paste and cover the lamp with it. Let the mixture sit on the gold and brass lamp for about 30 minutes. Rinse with warm water and buff dry until it shines. 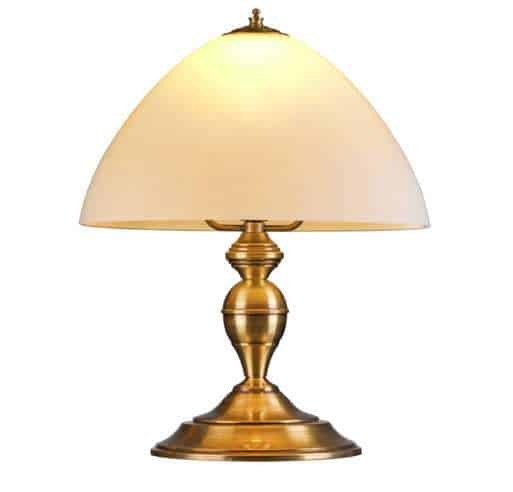 Commercial polishes and metal cleaners are also very effective in cleaning and polishing gold and brass lamps. 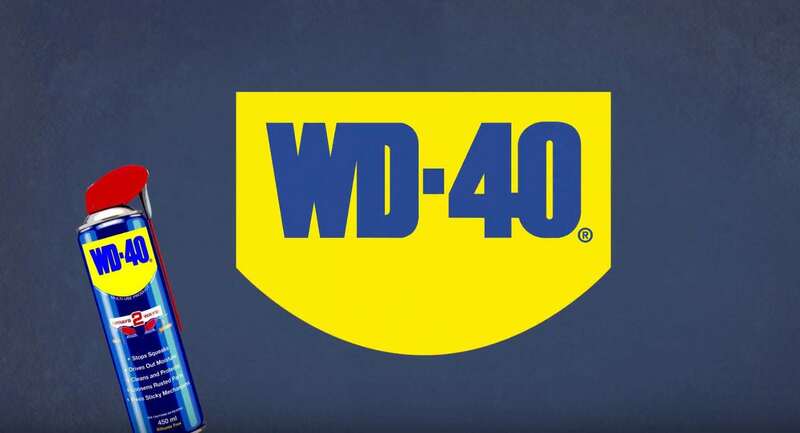 We like to use WD-40. It is not only very easy to use, but is also quick and very effective. All you need to do is coat the gold and brass lamp with a layer of WD-40, which is a great to clean brass and let it sit for about 15-30 minutes. Take a clean cloth and rub the lamp in circular motions drying and buffing it up. It will clean and polish brass and gold lamp and will make it shine bright as good as new. Here are some precautions you should keep in mind when cleaning and polishing gold and brass lamps using brass cleaner and brass polish. Do not use scrubbing cloths that are highly abrasive. Similarly, avoid using steel wool or metal bristled brushes as they will leave scratches on the surface of the lamp. A thin coating of mineral oil or linseed oil can be effective in preventing tarnishing. Apply the oil after cleaning the brass and gold lamp using a soft terry towel. Most of the gold and brass lamps come with a lacquer finish. Therefore, it should not be cleaned using hot soapy water. If such gold and brass lamps are heavily tarnished, you need to use a varnish or paint remover to first remove the lacquer and then use on of the techniques mentioned above to clean and polish your gold and brass lamp. Once done, relacquer the lamp to keep it shining and protected. Try avoid touching gold and brass items too much. Oil from your hands can hasten the tarnishing process and reduce the life of your gold and brass objects. Your gold and brass lamps will keep shining for long if your clean and polish them regularly. It is important to avoid accumulation of dust, dirt and tarnish on objects made from gold and brass to keep them lustrous, bright and shiny. With the above mentioned tips and tricks, you can clean and polish all your gold and brass objects and not just lamps and make them look as good and shining as new.